Living with dementia, is like living different parts of your life again, in no particular order. The disease pulls a person from being fully aware of life around them, like a filter has been placed on reality. In Switzerland it’s estimated about 107,000 people suffer from a form of dementia, and nursing homes are increasingly taking up the task caring for these dementia patients. And one home in Bern has added a high-tech virtual train to give residents an unconventional experience. The alpine landscape flies past on the rail route from Bern to Brig, as Johnny Cash’s “Ring of Fire” brings a sense of nostalgia to the trip. 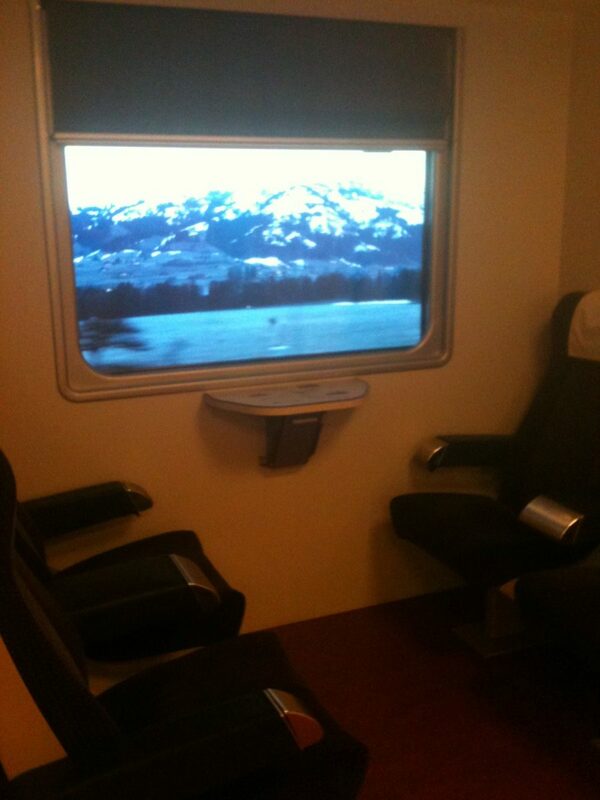 But these four train seats, the window, the map on the table aren’t in a train, and are not heading from Bern to Brig. Patrizia Baeriswyl is director of care and treatment at Domicil Bethlehamacker in Bern. The nursing home specializing in dementia has about 72 residents. She says this is the train section, patients can come and go as they please. Maybe the ride, and then step out to the garden. News of this virtual train began spreading a few weeks ago, and critique was not far behind. Is this an alternate reality for the patients? Do they know what’s happening? Patients can look out a ‘window’ and follow a train journey to anywhere they’d like. Baeriswyl says she thinks people are confused by the idea. She says if people think they just put residents in the train and walk away, they misunderstand. That is not the idea, she says, this is part of a concept, and very small part of a concept where the focus is on the emotional well-being of residents. Baeriswyl says this used to be a standard care home, but now the level of care is diversified. Quality of life is paramount, and the virtual train is just one of Bethlehamacker’s experience spaces. There is the garden, Baeriswyl says, or a spa-like treatment room. Or a waterbed where colors are projected on walls, or another where the sky is painted onto the ceiling, with changing daylight. All of this is to create a calm atmosphere for residents. “The reality in nursing homes today is dementia. There are more with dementia than people without dementia,” says Birgitta Martensson, managing director of the Swiss Alzheimer’s Association. Martensson wants to be clear that she has not seen the virtual train in Bern, nor is she criticizing the work of Bethlehamacker. But she can speak generally, about treatments. Patrizia Baeriswyl at Bethlehamacker says it is not about creating an alternate reality—that’s not it at all. And the virtual train is not taking the place of staff—all positions are filled. In other spots, Birgitta Martensson with the Swiss Alzheimer’s Association says a lack of personnel has already caused another serious concern. “The other option that is used far too much, and which is much more dangerous for me is drugs; is to give drugs to keep the persons calm,” she says. Parliament is already moving on creating a national strategy on dementia care, but Martensson says health care is still a cantonal issue. So if Bethlehamacker in Bern has developed something helpful, there is no formal framework to spread the idea. Bethlehamacker is trying to inform and spread its innovations anyway, planning an informational sesson with cantonal dementia groups next month.